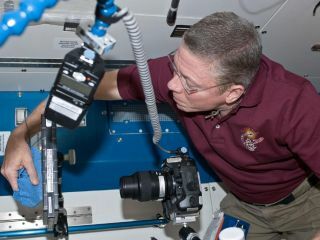 NASA's Mike Fossum, Expedition 29 commander, conducts a session with the Binary Colloidal Alloy Test-6 (BCAT-6) experiment in the Kibo laboratory of the International Space Station on Oct. 24, 2011. After living in space for nearly six months on the International Space Station, NASA astronaut Mike Fossum is still getting used to his "land legs." Fossum and his crewmates, Russian cosmonaut Sergei Volkov and Japanese astronaut Satoshi Furukawa, launched to the International Space Station in June. The trio returned to Earth 10 days ago, on Nov. 21, landing in a Russian Soyuz capsule on the frigid and snowy steppes of Kazakhstan in Central Asia. Fossum, who was commander of the space station's Expedition 29 mission, previously visited the orbiting outpost on two separate space shuttle missions. But, this return trip inside the notoriously cramped Soyuz spacecraft was a very different experience, he said. "The trip home on a Soyuz spacecraft was very memorable," Fossum told reporters today (Dec. 1) in a series of live satellite interviews from NASA's Johnson Space Center in Houston. "It was like riding a meteor home inside that fireball." As the capsule made its scorching re-entry through Earth's atmosphere, Fossum described looking out the window next to him and being able to see the spacecraft's plasma trail. "We had the full ride home in darkness and got to see the plasma trail and heat shield itself," Fossum explained. "You have these incandescent orange pieces of the heat shield screaming by the window. It was like a fireworks display." Space station commander Mike Fossum spoke with SPACE.com from aboard the orbiting complex on Oct. 19, 2011. Fossum and his crewmates were also the last space station residents to play host to a visiting space shuttle. NASA launched the shuttle Atlantis and a four-astronaut crew to the orbiting outpost on the agency's last-ever shuttle flight in July. "I caught a peek and managed to snap some photos of Atlantis as she was backing away for the last time," he said. "To see her back away on that final mission with the sensor boom across the payload bay — to me, it looked kind of like a salute as she backed away and headed home." With Atlantis' jam-packed eight-day mission, the finality of the shuttle program did not sink in until the very end, when the hatches between the station and the orbiter were being sealed, Fossum said. "It really wasn't until the end when the main job was done and we were down to taking the last photos, cleaning things up and getting ready to close the hatches, and we realized, we're closing this hatch for the last time in we-don't-know-how-long," he said. A member of the Expedition 28 crew aboard the International Space Station caught this spectacular photo of a lifetime, showing space shuttle Atlantis actually hurtling through the Earth's atmosphere on its way back to Kennedy Space Center, Florida, July 21, 2011. With the retirement of the space shuttle program, NASA is currently relying on Russian-built rockets and spacecraft to take American astronauts to the space station. In the meantime, commercial companies are developing new spaceships to take cargo and humans to and from the orbiting complex. These commercial vehicles are critical for NASA's future in human spaceflight, Fossum said. "I think we need a second launch system for sure — a second way to get people to and from the space station," he said. "The Soyuz booster is a great program, very successful by any measure, but it still is a single program, and things can happen. Students of space history know things can happen, and we're not immune to things happening in the future. I hope we get another capability for getting humans to and from space soon." Still, the veteran astronaut remains hopeful for the future, and spoke extensively about the exciting research projects that are being conducted at the International Space Station. Fossum said the months he spent living on the orbiting outpost were a dream come true. Fossum said that while he's thankful to be back on terra firma with his friends and family, he will miss living in space, and hopes to be able to have the opportunity to fly again soon. "For me, it never got old," Fossum said with a wide smile. "I hoped I could fly this mission until I was tired of living in space, but I didn't achieve that, so who knows. We'll see."